Social movement theory suggests that effectively framing the cause of a problem (diagnostic fram­ing), its solutions (prognostic framing), and reasons to support its solutions (motivational framing) is likely to be essential for reaching movement goals. In this paper, we apply social movement framing theory to empirically identify prognostic, diag­nostic, and motivational frames in the growing food justice movement in the U.S. We use the case of the Food Dignity project, a five-year, U.S. Department of Agriculture (USDA)–funded, action and research collaboration between academics and leaders at five community-based food justice organizations. We coded multiple data sources, both public and internal to the project, to identify the strongest and most common diagnostic, prog­nostic, and motivational frames used by 25 indivi­dual collaborators in the Food Dignity project. 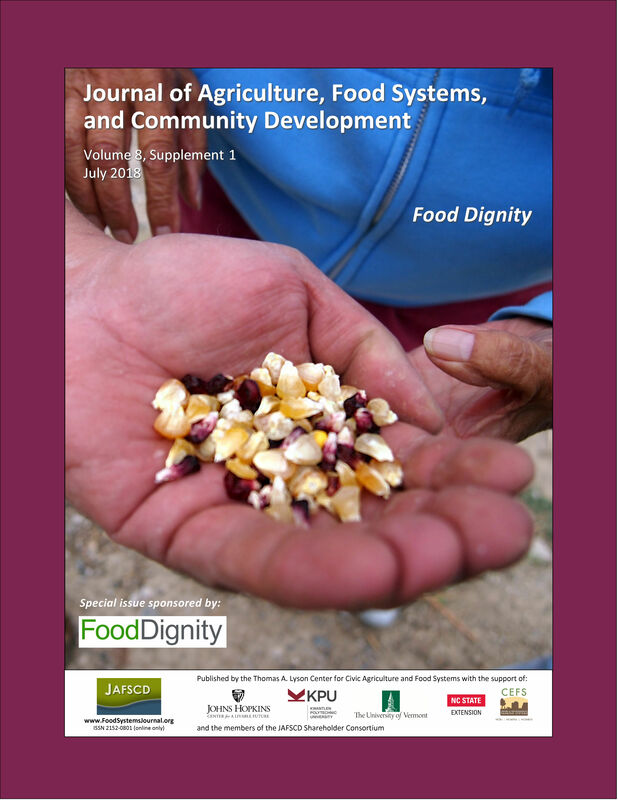 Results suggest that the majority of diagnostic frames used by Food Dignity partners did not relate directly to food, but included instead insufficient resources, loss of place, degraded community, and constrained choice and response-ability (Minkler, 1999) as causes of problems—though a broken food system also emerged as a causal frame. Similarly, solution framing included one overarching food-related strategy, which we labelled “great food.” The other prognostic frames were reclaiming power, growing the local economy, strengthening community, fostering sustainable organizations, and networking. We did not find any motivational frames in the first round of semi-open coding. However, when we returned to reexamine the data with a hypothesis informed by our project experience beyond the textual data, we identified the motivational frame that we call recompense. Recompense suggests that those who have bene­fited from our current food systems should now work toward justice for those who sacrificed, usually unwillingly, to create them. This frame was mostly used indirectly and by community-based (rather than academic) partners in the project. Identifying these food justice diagnostic, prognos­tic, and motivational frames may help movement leaders to more explicitly examine and employ them and is an essential step for future research in assessing their effectiveness for creating a just, sustainable and healthy food system. Master’s student at the University of Wyoming. Gaechter is now a doctoral student in Environmental Health and Engineering, Johns Hopkins Bloomberg School of Public Health.